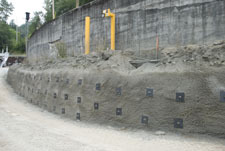 NW Civil completed the final design and permitting for this slope stabilization project located in Tacoma, Washington. We are currently preparing to begin construction for this design-build project beginning in Aril 2010. Over 4,000 lineal feet of injection bored (IBO) micropiles will be installed to stabilize existing retaining walls along the site. Reticulated miropile walls will also be installed to stabilize additional portions of the slope. NW Civil completed the civil construction phase for the Western Marine office building in November 2009. We provided complete site civil and shoring design & permitting for this 5-story office building located within an ECA landslide area of West Seattle. We completed this project as a design-build by performing all the site civil and shoring construction. 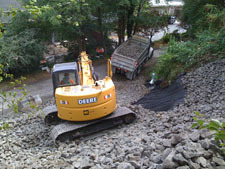 NW Civil worked with a private homeowner and the Seattle Parks Department to install a rock butress stabilization along a section of the Burke-Gilman Trail. Detailed scheduling and management allowed the construction phase to be completed within 5 days. Trail use was maintained through the entire project. NW Civil designed and installed injection bored (IBO) micropiles to support existing footings in order to allow excvation and construction of new foundations adjacent to and beneath the exsting structures. These micropiles were drilled through very dense cobbles and boulders to provide support capacities in excess of 30 kips per pile. 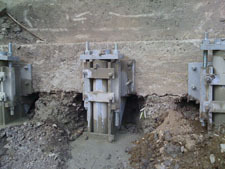 Underpinning brackets were used to connect the micropiles to the existing foundations. NW Civil recently completed this design-build soil nail shoring wall as part of the Baker River Fish Passage Project in Concrete, Washington. This project was completed as a fast-track design-build project to allow construction of a temporary crane access road. The soil nail wall was designed to support both the excavation cut and the existing historic concrete retaining wall above it. Interested in checking out what NW Civil has been bidding on in the public arena? Click here for our information reported in the Daily Journal of Commerce. SCS Requirement? 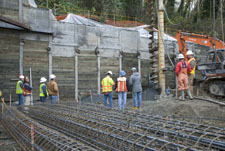 We are a King County SCS certified firm and can provide engineering or construction services for your King County project. Click here for our SCS information. NW Civil employs a diverse team of professionals whose expertise is focused on what the company does best: implement site-specific solutions that are efficient, cost-effective, and delivered on schedule. With technical expertise ranging from planning—to engineering—to construction, NW Civil is strategically positioned to support both private and public sector clients through execution of a wide range of projects. NW Civil brings innovation, experience, and quality to the civil, geotechnical, and environmental engineering & construction fields. Whether you are looking for just engineering, just construction, or complete combined design-build services, we have you covered. Our engineers and project managers have proven experience and technical knowledge in all aspects of civil engineering and design. Our civil engineering services include everything from site surveying through plan and specification preparation for design–bid projects. We provide a full range of civil CAD design services including volume calculations, as-built surveys, site plan development, grading plans, foundation plans, erosion control plans, stormwater conveyance plans, and in-house development of full contract documents (specifications and drawings). We have completed projects ranging in size from small sidewalk design to large scale road and bridge design. We apply state–of–the–art technology and training to provide practical and constructible solutions to civil engineering projects. Our engineers are proficient in Autocad and work through design scenarios in 2-D and 3-D environments. 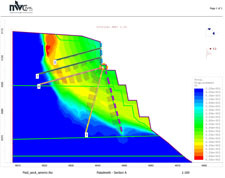 Using 3-D design software allows us to interactively work with our clients and provide detailed design information that can be used to make critical decisions or design changes early on in the project. 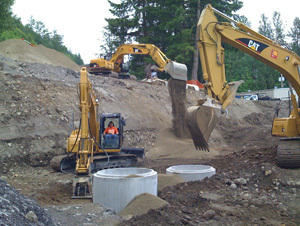 Our staff of geotechnical engineers includes two professional geotechnical engineers with a long history of working on projects in the Pacific Northwest. Our geotechnical experience includes: subsurface investigations and reporting; soils laboratory testing; slope stability analysis, settlement and consolidation; shallow and deep foundation design; shoring design; retaining wall design; pavement design; and construction monitoring. Our staff is familiar with the Pacific Northwest geology and can help with all of your geotechnical needs. Our environmental experience and services include everything from erosion and sedimentation control to contaminated soil and groundwater remediation. We approach every project in a manner that balances the needs of the client with the needs to the environment. Where ever possible we incorporate low impact design methods. Our stormwater design services and experience includes detention ponds, water quality treatment, surface water runoff and conveyance, porous pavements, and infiltration systems. Our certified erosion and sediment control specialists can prepare TESC plans and handle all of your permitting requirements from initial design through construction completion. Whether you need to develop within an environmentally critical area (ECA) or need to work within a fish bearing stream, we can help you with your permitting requirements. Our engineers are experienced in the areas of habitat restoration, stream restoration, stream bypass, stormwater conveyance, stormwater treatment, and culvert replacement. We can provide turnkey services in all of these areas from planning and permitting (HPA, JARPA, SEPA), to design, and construction. NW Civil holds a Washington State general contractor license along with surety bonding, and insurance required to execute design-build and civil construction projects. As the design–builder and general contractor, NW Civil takes single point of responsibility for all aspects of the project, from initial planning through design, construction, and project closeout, using our depth of experience and resources in planning, permitting, design and construction. We provide construction management services with a professional staff of experienced construction managers. 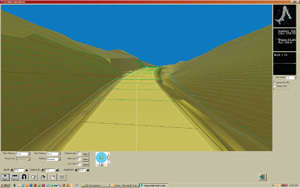 We provide critical path method scheduling services using Primavera™ and Microsoft™ Project software. We can act as the owner’s representative handling permitting, schedule review, submittal tracking and review, constructability review, payment application review and coordination of contractors and consultants. 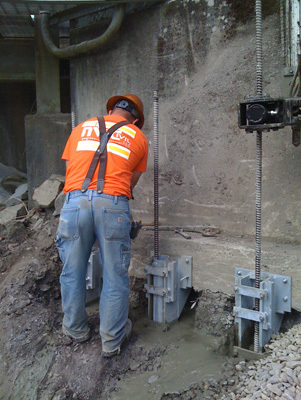 We provide construction monitoring and inspection services for geotechnical special inspection requirements and also provide erosion control inspection and permit compliance monitoring for Construction Stormwater Permit sites. 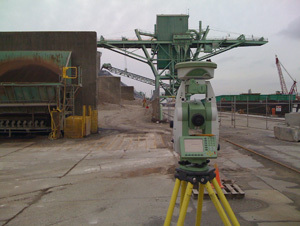 We provide complete surveying and mapping services. Whether you need remote surveying, construction stakeout, GIS mapping, establishment of new control points, or detailed topographic surveying we fast, efficient, and precise soultions. We use a Leica System 1200 Smartstation with built-in GPS/TPS/RTK capabilities. Using RTK and the Spider Network, we can reduce survey setup and travesing time resulting in up to 50% faster surveying than typical GPS/TPS surveying techniques. We can provide complete construction stakeout and as-built surveying to millimeter accuracy using reference line stakeout programs. As-built information can be collected using reflectorless EDM and imported into AutoCad Civil 3D or Autocad Map for drawing production or GIS information. Our Leica 1200 is fully robotic which allows for fast, efficient, and precise stakeout surveying. For remote areas, the smartstation can be used for static GPS postioning and the data post-processed through OPUS for coordinate system establishment. 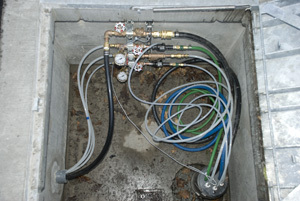 The combined TPS/GPS smartstation allows for TPS surveying to occur simeltaneously with static GPS data collection. This eliminates the need to occupy points with two separate instruments and greatly reduces the total surveying time for remote areas.